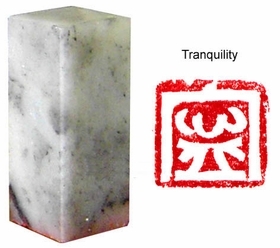 This Chinese seal/stamp is 100% hand carved. Base Dimension: approx. 3/4" x 3/4"
The traditional Chinese symbol - "Tranquility" is professionally carved into the bottom of this seal stone. Please note: each stone is different. The pattern / color of the stone may not be exactly the same.